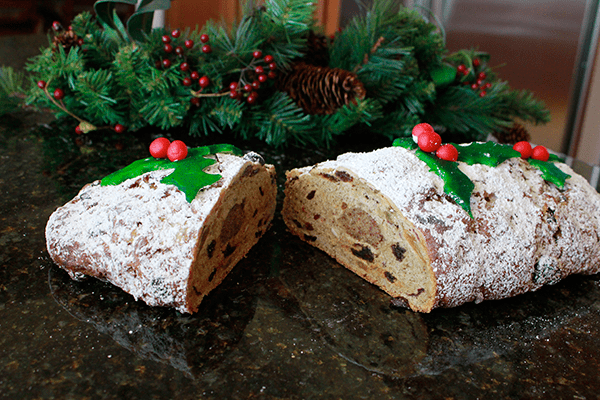 We have been buying (and eating) marzipan-infused Stollen at Christmas for years. But this year (2016) with Henry up from UCSD we decided to make our own, adapting "The Great American Baking Show" recipe (Peter & Henz). 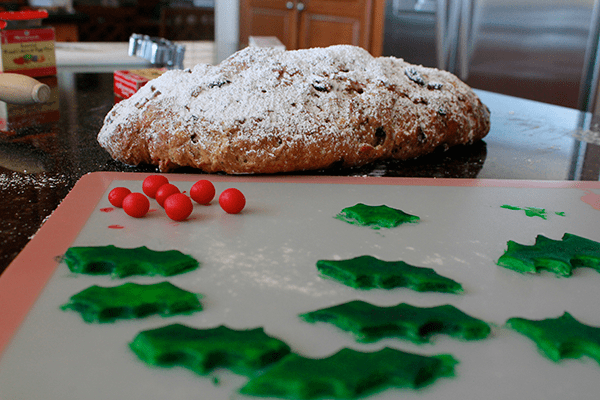 There are four parts to this: The bread dough, the dried fruit filling, the marzipan center and the topping and marzipan holly decorations. So, it's a good recipe to double team. And with the rising of the dough (twice) that takes an hour or so each time you will want to start in the morning. 1. 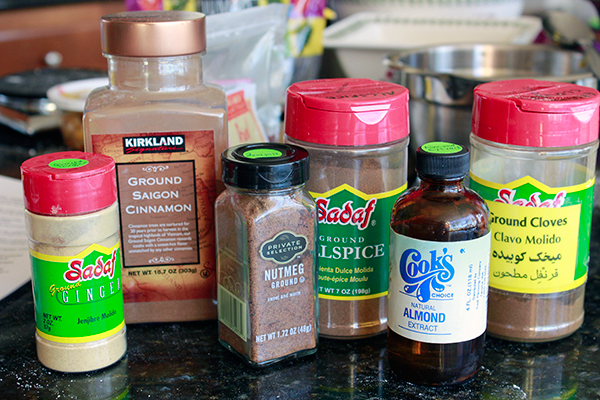 Measure the flour, cinnamon, ginger, allspice, cloves, nutmeg,and sugar into a large bowl. Add the yeast on one side of the bowl and the salt on the other. 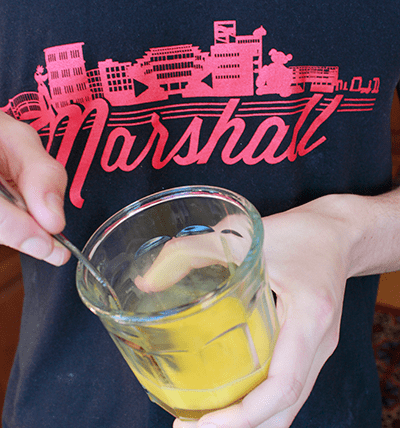 Beat the milk, egg, almond extract and butter together in a cup and pour over the dry ingredients. 2. Bring the mixture together to form a soft dough. 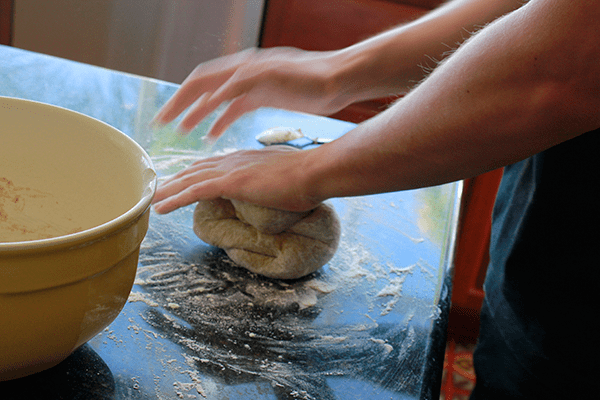 Transfer to a generously floured work surface and knead for 6-7 minutes, until smooth and pliable. 3. Place the dough in an oiled bowl, cover with cling wrap and leave to rise for 45 minutes to 1.5 hours somewhere warm until doubled in size. 4. 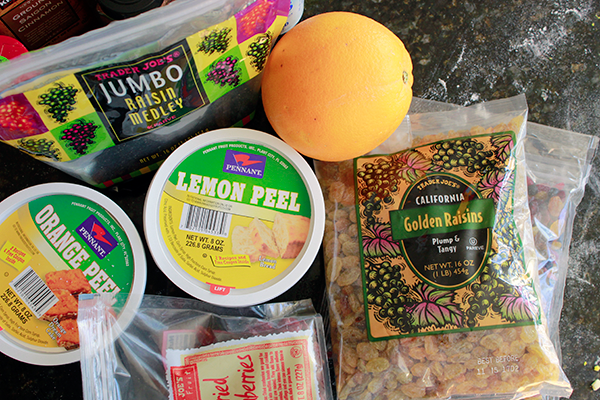 Place the dark raisins, golden raisins, cranberries, candied orange and lemon peel and the orange zest in a bowl. 5. 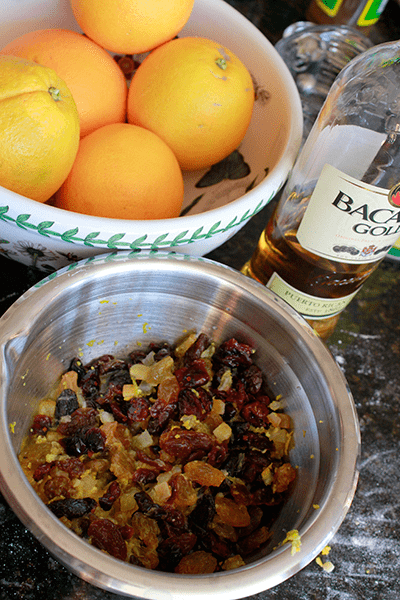 Heat the orange juice and rum in a small pan to just below boiling point, then pour over the fruit and mix well together. Leave to stand for 45 minutes to 1.5 hours while the dough rises. 6. Mix the ground almonds and superfine sugar together in a bowl. Stir in the egg and almond extract. Knead in the bowl to form a stiff paste, but do not over- knead as this will make the paste oily. 7. 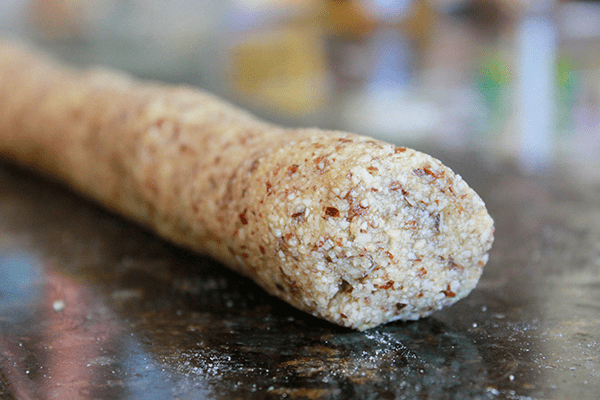 Roll two thirds of the marzipan into a sausage approximately 26cm long. Wrap in cling wrap and chill. Wrap the remaining one third of marzipan in cling wrap and chill. 9. 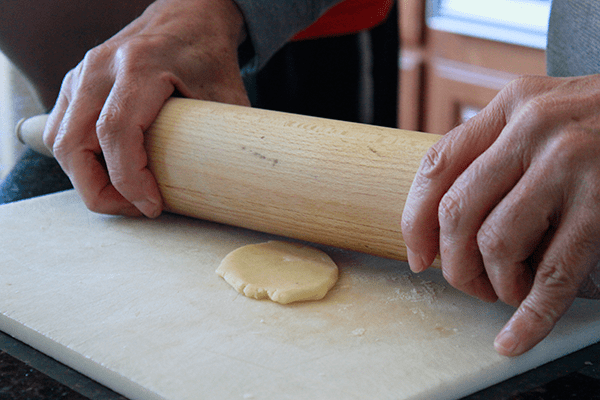 Roll the dough into a flat oval approximately 12 x 9 inches and place the marzipan roll down the middle of the dough. 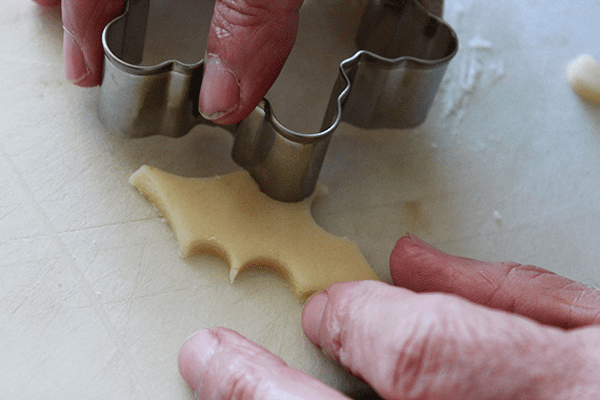 Roll the dough up to encase the marzipan, sealing the ends and leaving the seam underneath. 10. Transfer fruity dough to a lightly floured baking sheet and place in a proofing bag or cover over with lightly oiled cling film. Leave to rise for 45 minutes to 1.5 hours in a warm spot until nearly doubled in size. 11. Heat the oven to 350F. Remove the stollen from the proofing bag and bake for 30 to 40 minutes until golden, risen and the underside sounds hollow when tapped. Take care not to overcook. Leave to cool on a wire rack. 12. 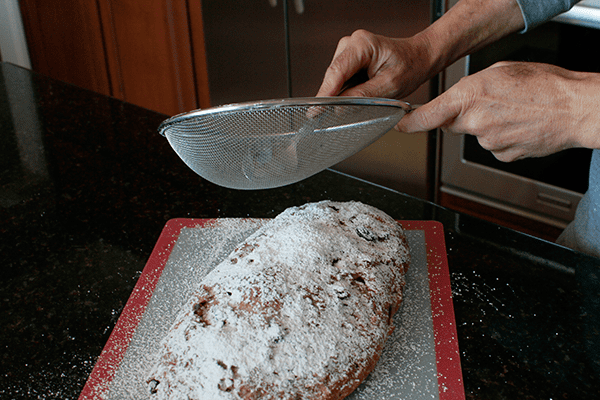 For the topping, brush the baked warm stollen with melted butter and drench with superfine sugar. 13. 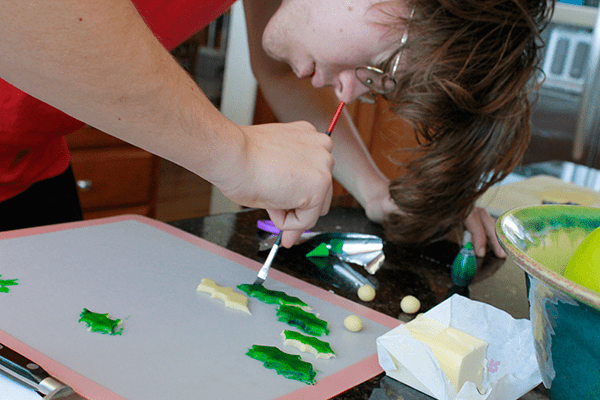 You can kneed the marzipan with the food color or paint it once you have your shapes. Roll 3 quarters of the remaining marzipan out on a surface lightly dusted with superfine sugar and cut out 9 holly leaves. Roll 9 holly berries. 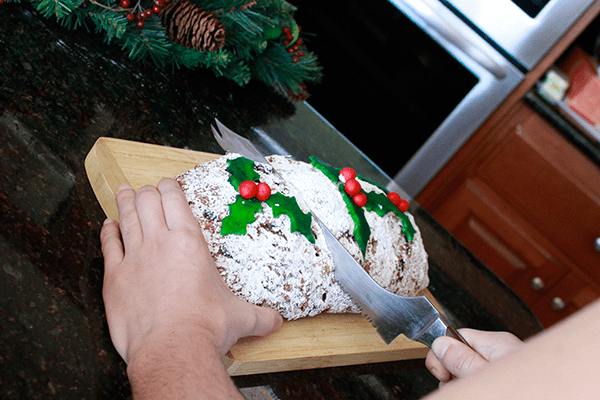 Decorate the stollen with 3 clusters of holly leaves and berries.